For over 28 years we have been the original and established leader in walk-through aquarium design, construction and management for 24 successfully operated and profitable public aquariums around the world. Never before has there been such global interest in the underwater world and the necessity to understand and protect the fragile eco systems it supports. We are a committed part of this world movement and pride ourselves on being the first company to make accessible the secrets of the underwater world introducing the first walk-through aquariums to Europe, Australasia, Asia, Russia and the Middle East. Proud to be a 100% owned New Zealand Company, we uses the spirits of our pioneering people to forge ahead in the industry taking its state of the art aquarium technology to all points of the globe. Having revolutionized the format of aquariums by developing horizontally curved 'underwater tunnels' they have turned aquariums into underwater worlds that have allowed the visitor to experience the wonders ofthe ocean as few, other than experienced divers, have ever seen. Over 250 million satisfied people have been enthralled and educated by our aquariums worldwide and almost every one of these projects has won awards for excellence, this includes awards for best new tourist attractions in New Zealand, Australia and Great Britain. 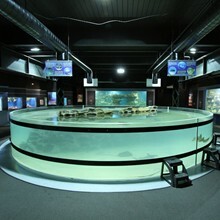 The New Zealand aquarium was voted second best new tourist attraction in the world the year after its opening. Such experiences place us as number one in the industry. A particular feature of our work is the ability to provide, at a commercially competitive price, a complete in-house service for all aspects of the project. The New Zealand base provides us with world class technological and professional skills at a competitive cost structure. The aquarium components are constructed in New Zealand in kitset form and shipped in sealed containers directly to the site, then assembled by skilled installation teams. This enables us to provide a turn-key service delivered on time and within budget. New Zealand companies generally have a reputation for getting the job done. We maintain a significant ongoing research and development strategy to ensure it remains at the forefront of the aquarium industry. We invite you to journey through the underwater world with us.